Great picture as usual Gabriel. Thanks for the linky. I think this might be my first time at your blog for a WW. 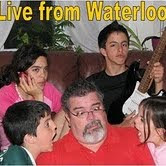 Its been awhile since I last went Live from Waterloo. Looks serious. Wondering obout the hands behind the back, what they may indicate or conceal. Great pic! Well, mine is finally up. Better late than never, right? Happy WW (what's left of it! ).